Today’s review features the Star Wars Princess Leia inspired Hope bracelet by Lillian & Co. This bracelet is part of the Star Wars ‘Galaxy’ bracelet range, which includes three different designs inspired by Princess Leia, Han Solo, and Yoda. 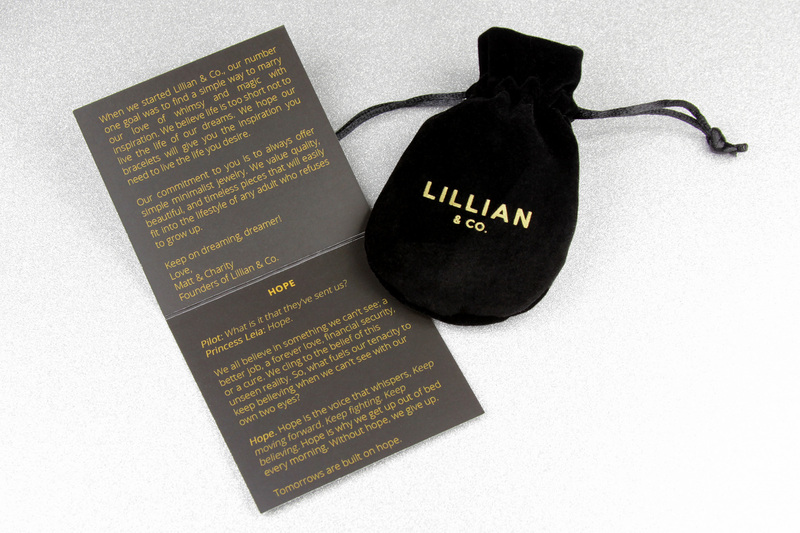 The Lillian & Co brand is founded on inspiration and motivation, keeping words of wisdom close by with beautiful jewelry. Of course, Princess Leia is the perfect choice for inspiring words for Star Wars fans. Hope. Hope is the voice that whispers, Keep moving forward. Keep fighting. Keep believing. Hope is why we get up out of bed every morning. Without hope, we give up. Tomorrows are built on hope. Available in three colour finishes (gold, rose gold, and silver), the bracelet is priced at US$32.00 each – Lillian & Co can ship internationally! Get free shipping (and free returns) on all orders to US addresses. Women’s Star Wars Galaxy Bracelet Set – US$96.00 per set – currently on sale for US$55.00 per set! The Hope bracelet came in a black gift box presentation. 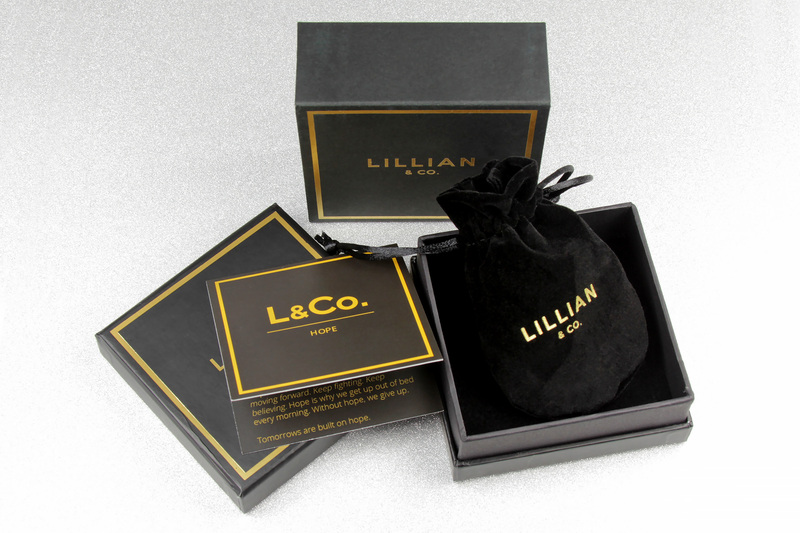 This packaging is used for the ‘Galaxy’ bracelet collection – other bracelets from Lillian & Co come in white box with black text. The black and gold of this packaging really stands out, and matches the Star Wars theme well. 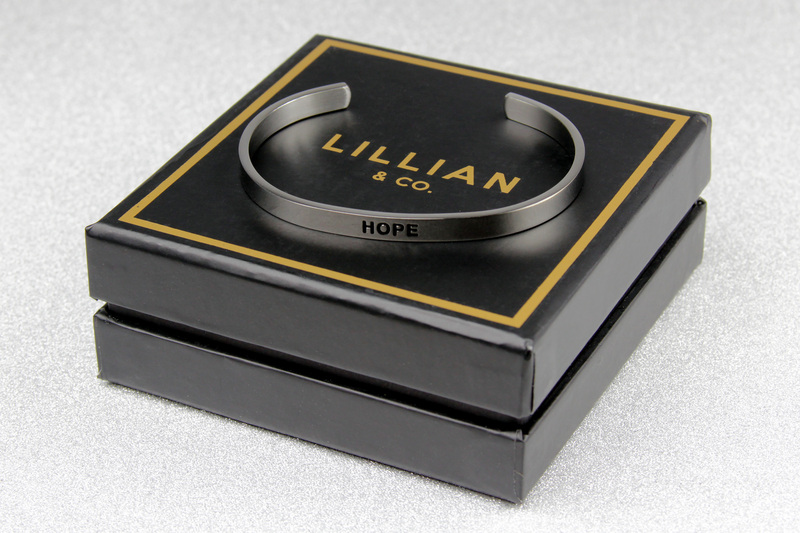 The outer sleeve of the gift box has the bracelet style and colour printed on the side – in this case ‘Hope’ and ‘Silver’. 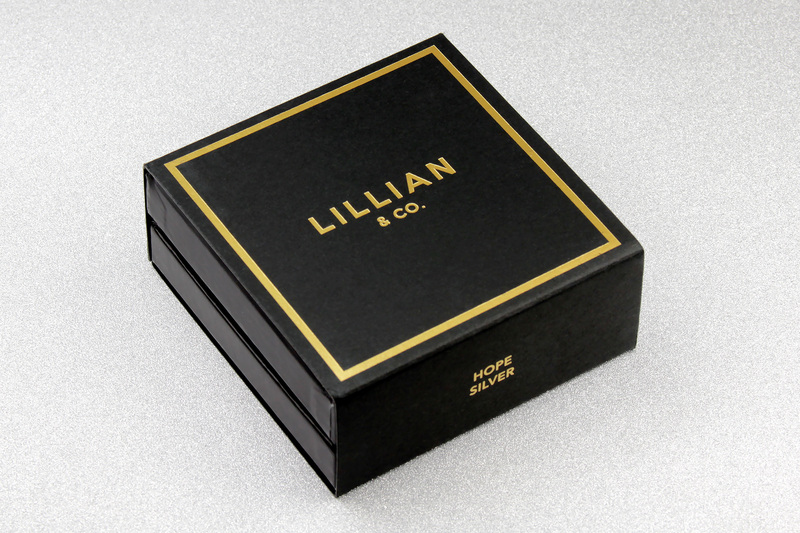 Removing the sleeve reveals the gift box inside – the gift box lid features the same printed gold Lillian & Co logo and boarder design of the outer sleeve. Inside the box, the bracelet is kept inside a black velvet drawstring bag. 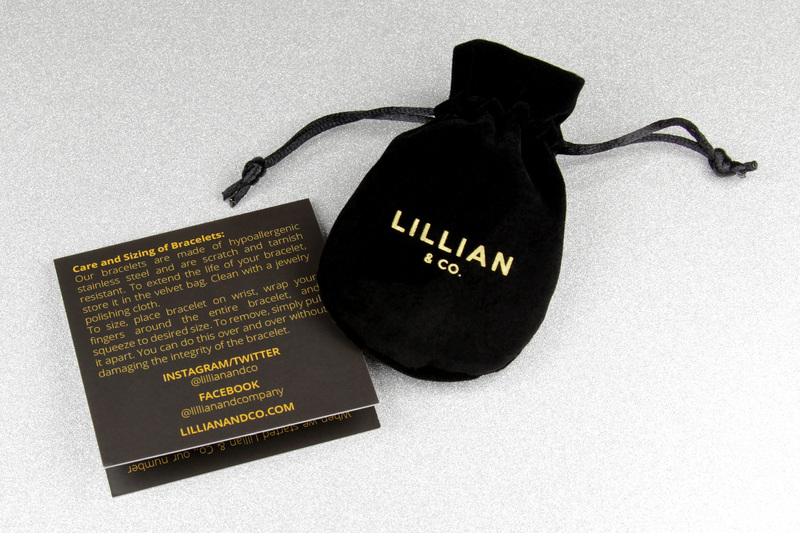 Again, this bag features the Lillian & Co logo printed in gold on the front. The bag rests on a black velvet-topped foam insert at the bottom of the box. Seriously, the packaging is so nice! Perfect for giving as a gift, or a special treat for yourself. Opening this box was quite like Christmas! 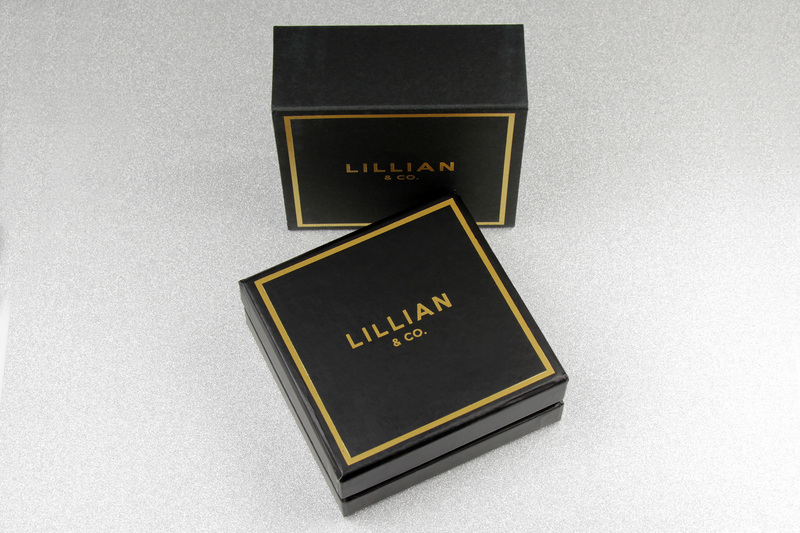 I was just so impressed with the quality of the packaging – even though I had seen pictures of the box/packaging on the Lillian & Co website, it was just much more ‘lux’ in person than I was expecting. The cardboard gift box is quite sturdy, you can keep it for storing your bracelet in. 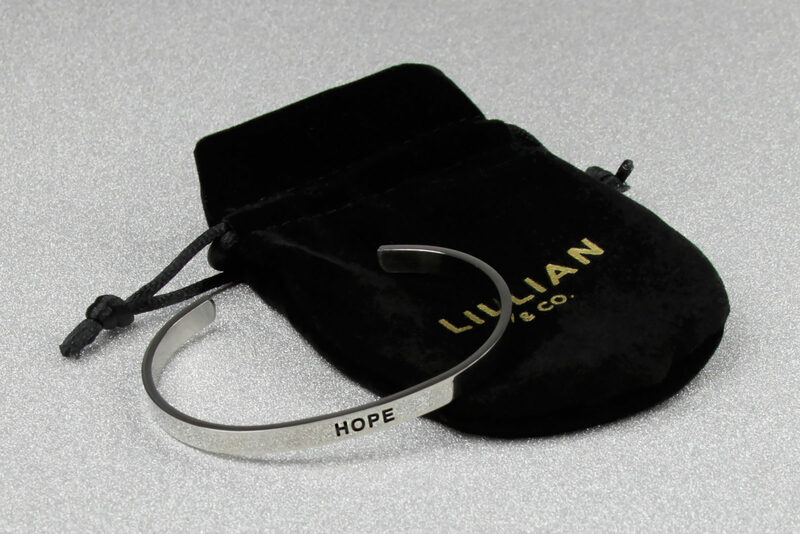 Also inside the box – a black card with a blurb about Lillian & Co, and text specific to this bracelet about Hope. 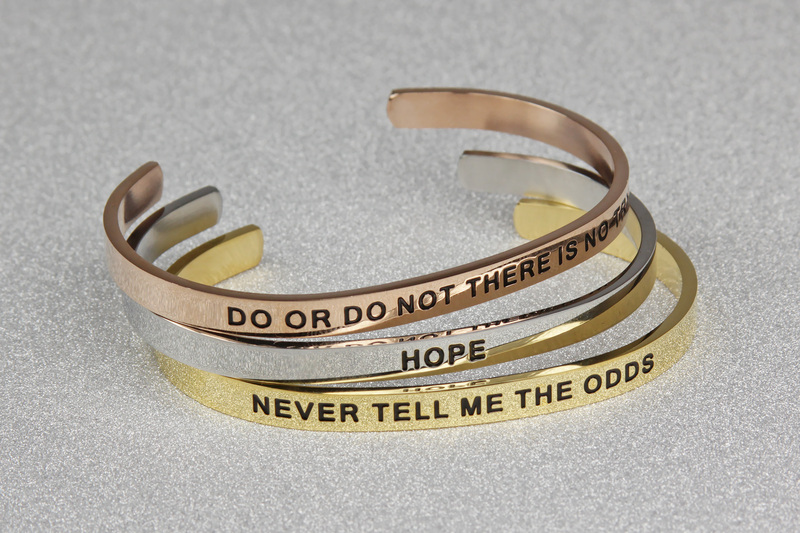 While of course this bracelet is inspired by Princess Leia’s dialogue in Rogue One, the message of hope is bigger than Star Wars, and something we all need at some point in our lives. A simple message of positivity we can hold on to, just like the Rebel Alliance fighting against seemingly impossible odds to capture the Death Star plans. Pilot: what is that they’ve sent us? We all believe in something we can’t see; a better job, a forever love, financial security, or a cure. We cling to the belief of this unseen reality. So what fuels our tenacity to keep believing when we can’t see with our own two eyes? Hope. Hope is the voice that whispers, Keep moving forward, Keep Fighting, Keep believing. Hope is why we get up out of bed every morning. Without hope, we give up. 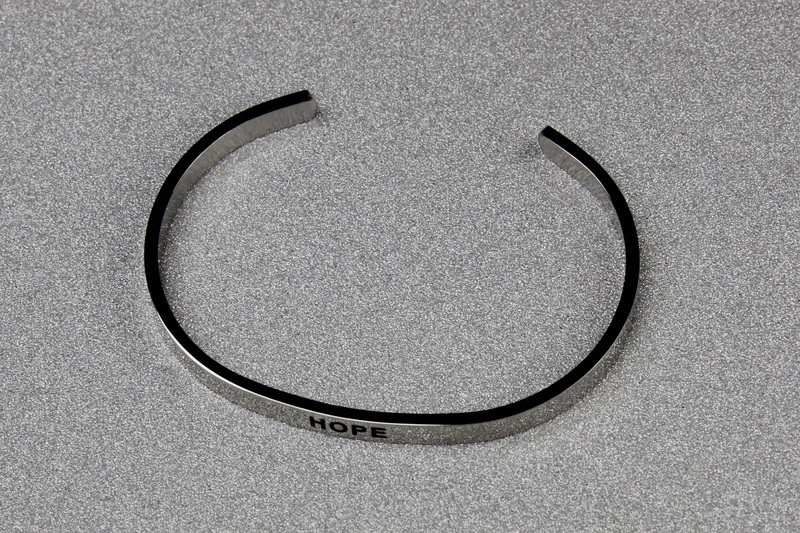 This ‘Hope’ bracelet is made from a simple flat-faced bangle, with the text ‘HOPE’ printed in easy-to-read capital letters. 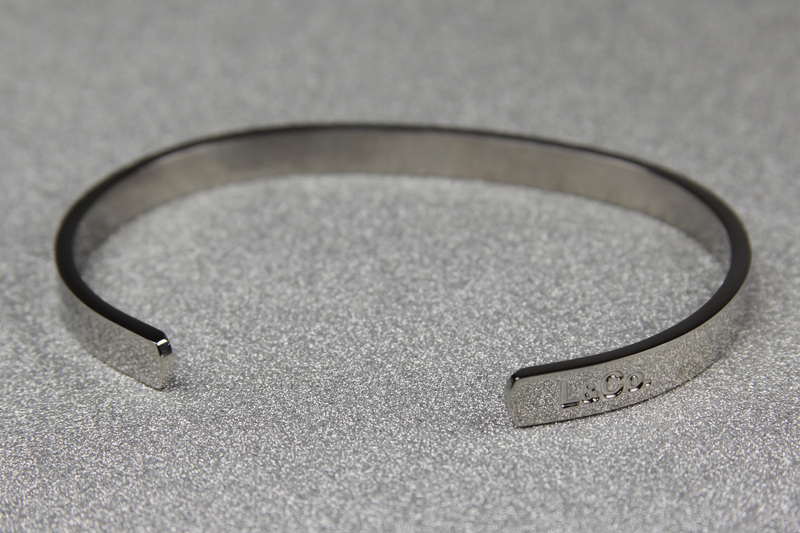 The text is recessed, and accented in black, so it stands out against the shiny finish of the bracelet. While of course I am no stranger to ‘loud and proud’ Star Wars jewelry, I still love subtle designs like this as well. While wearing the bracelet, I am constantly reminded of Princess Leia, but to anyone else, it is a gorgeous classic bangle with a message of hope. This sleek design can be paired with more obviously Star Wars bracelets (like the other designs in the Lillian & Co Star Wars ‘Galaxy’ range), or a Rebel Alliance symbol charm bracelet – or keep it classic with a clear rhinestone/diamond accent bangle. The choice is yours! The insert card notes this bracelet is made from ‘hypoallergenic stainless steel’ – it has the most amazingly shiny finish! If you’re looking for a precious metal finish, the gold colour version of this bracelet is plated in 18K gold. Honestly, I could easily find reasons to buy this bracelet in all three colour choices, to pair with any outfit/jewelry look! With a simple design like this, it can be easy for the item to look ‘basic’ – that isn’t the case here. This bracelet looks right at home alongside my ‘traditional’ jewelry like my diamond engagement ring or white gold necklace. It has a proper ‘jewelry’ feel to it, the quality is superb. The ‘right’ outer end of the band has the simplified Lillian & Co ‘L&Co.’ logo recessed. Unlike the main ‘Hope’ text, this stamp is not accented with black, so it doesn’t detract from the sleek design. The ends of the band are curved/rounded, so there are no sharp corners when putting on/taking off the bracelet (and it always looks nicer as well). The inside surface of the band is plain, so it fits comfortably against your skin. To size, place bracelet on wrist, wrap your fingers around the entire bracelet, and squeeze to desired size. To remove, simply pull it apart. You can do this over and over without damaging the integrity of the bracelet. For me, I found the ‘default’ size perfect, I didn’t need to adjust the band opening to wear. The oval shape of the bracelet ensures the band doesn’t rotate around your wrist while wearing – the text stays on the top of your wrist at all times. Just glancing down at my wrist, I can read the text clearly and quickly. The band is wide enough to fit readable text, but slender enough for a ‘bangle’ style – you can stack this bracelet with other Lillian & Co designs, or with your own favourite coordinating bracelets. The bracelet isn’t heavy to wear, which I have found with some other wide-band bracelets. By my approximate measurement, the band measures 14.8cm end to end, with the ‘gap’ measuring 3.2cm in length (straight across), while the band measures 5mm high and 2mm thick. The circumference is of course adjustable, my measurement is the just the size of the bracelet straight out of the box. This bracelet, like the rest of the Lillian & Co range, is available in a variety of colour finishes. The women’s Hope bracelet has a polished shiny finish, with three colour choices – silver, gold, or rose gold. For me personally, I always feel like silver toned jewelry works best for a Princess Leia theme – during the Yavin medal ceremony, she wears silver jewelry, a silver belt and silver coloured shoes. Leia is most often associated with her white outfits in A New Hope, so silver always matches well with white Leia inspired outfits. 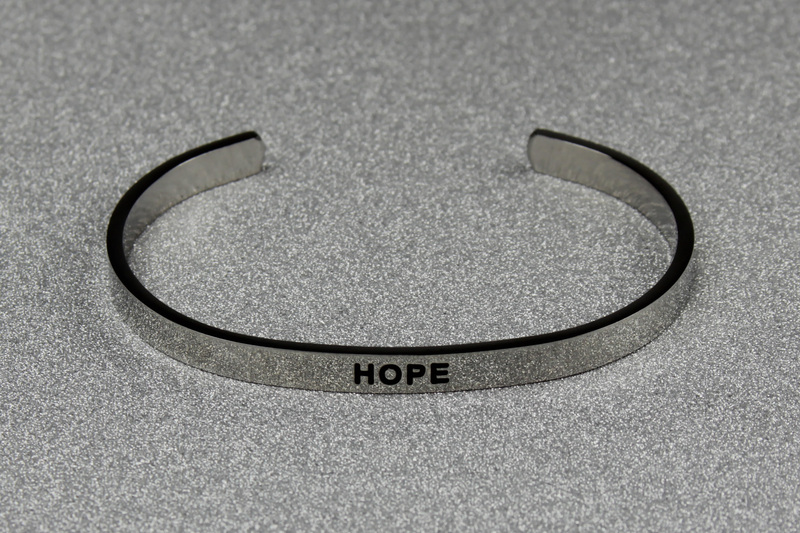 The Hope bracelet is also available in a men’s style bracelet, available in the same three colour choices – but with a matte finish – and has a slightly bigger circumference than the women’s bracelets. These bands are also adjustable, so you can wear the men’s bracelets if you prefer the matte finish. The Lillian & Co website notes the gold finish bracelets are coated in 18K gold, over the base stainless steel band. Sometimes classic designs don’t need any additional decorations – the sleek design of this Hope bracelet is so stunning. From the moment I picked up the gift box, I knew this was going to be a quality product, and will hold a special place in my jewelry collection. 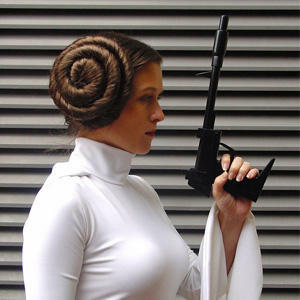 Not just for the Princess Leia theme, but for the inspiration that hope brings. Sometimes in our lives we need words of motivation to see past the clouds. I will be wearing this bracelet every day, keeping Princess Leia’s courage and hope with me always. Disclaimer: this item was supplied by Lillian & Co for review purposes. The Kessel Runway stands by the position that this, and all of our reviews, are an honest analysis and opinion regardless of whether the merchandise was purchased or supplied by a manufacturer/retailer.